AS night follows day, so too can westerners depend upon Allah’s Muslim Terrorists to infiltrate and penetrate, unopposed, into western spheres. And while they wreck jihad throughout Israel, rest assured, America is their TOP target. Inextricably, leftists in both countries have blood-soaked hands, as they lend Islam’s barbarians “legitimate” PC cover! Bastards. Fig-leafs. EVEN so, Israel, as the homeland of the Jewish people, stands in the way of jihadists and their leftist compadres, as they close in for the kill toward a total collapse of western civilization. This is the case, regardless of who sits at the helm. INHERENTLY, the historical and biblical homeland of the Jewish people serves as the west’s moral barometer; its standard-bearer to what humankind should aspire to. Now, none of this should be misconstrued as an apologia for Israel’s gravely derelict leadership, in so far as leftists rule its roost. Still yet, despite its poor excuse for leaders, the Jewish homeland stands as a beacon of light to the west, and Islam’s barbarians and their fellow leftist travelers must, heaven forfend, destroy and extinguish it. NEVER forget this. INESTIMABLY, Israel, if it falls, will become a knock-on blow – as the co-pillar to western civilization, or of what remains of it – to America’s collapse due to its moral failing(s). On the other side of the spectrum, Europe is considered the soft target, and this is so for a multiplicity of reasons. Let’s leave that aside for now. BUT before we continue with the latest jihadi terror, it must be noted that none of the following reportage should be unexpected. In fact, the opposite is the truth. AS a matter of record, the west has been falling off the cliff, albeit undetected, for decades. However, at least since 9/11/01 blew apart its teetering state of being, its vulnerability to jihad and leftist cheerleaders was, for the most part, unknown. IN fact, the recent indicator of “see no (Islamic/leftist) evil, hear no (Islamic/leftist) evil” is revealed by the absolute non-response, the deafening silence, re the decimation of Christianity throughout the Mid East and North Africa, even as it inches closer to America. How can this be? How can the Pope, the entire European ecumenical hierarchy, as well as America’s political and religious leadership, remain stone cold silent? Asked and answered. SO is it any wonder that while Christendom burns and Jews are continuously slaughtered, the west’s pusillanimous leaders and so-called elites party on? In tandem, a collaborative media and anti-western academia must be deemed colluding partners. Thus, the disintegration of the west marches forward. Somali refugee Abdul Razak Ali Artan posted on Facebook that he was ‘sick and tired of seeing my fellow Muslim brothers being killed and tortured’ shortly before he went on a slashing rampage at the Ohio State University that left 11 injured. ‘America! Stop interfering with other countries, especially Muslim Ummah (communities)… [if] you want us Muslims to stop carrying lone wolf attacks….continue reading…. WHICH brings us full circle to the LATEST act of Islamic jihad in Israel, out of a list that could fill book, after book, after book…. 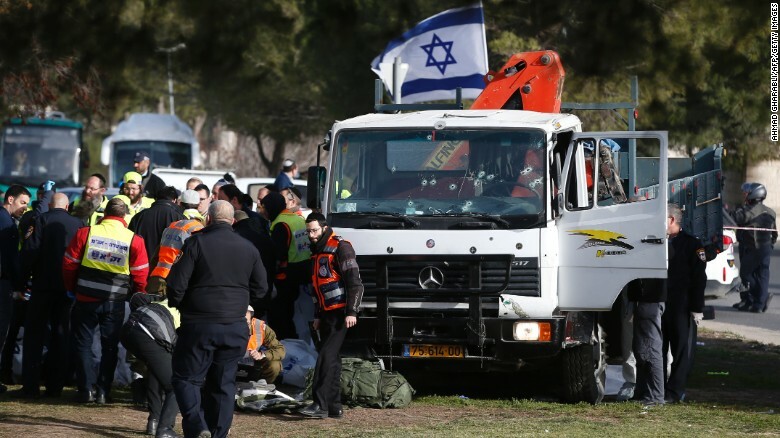 A heavy crane truck, driven by a Palestinian terrorist, rocketed back and forth across a patch of grass at the Armon Hanatziv promenade in Jerusalem, murdering 4 soldiers, three of them female servicewomen, and injuring 15, before a civilian security guard, Eytan Rond, and a soldier shot and killed the driver. Present at the scene were some 300 trainees of the IDF Officers’ School, Bahad 1 – all of them armed. Eytan described how he shot at the truck’s wheels but, when it kept on coming, he ran round to the driver’s side of the cab and shot him straight through the wind screen. The driver was killed on the spot. The photo attached to this article shows no more than 9 or 10 bullet holes, confirming the security guard’s statement that he emptied a magazine. He also reported that the officers and men closest to him hesitated to use their M-16 rifles, which he said were better than his own, and could have stopped the truck much sooner before it began wheeling back and forth and slamming into more victims. His account was confirmed by video footage, which shows dozens of uniformed men 30-50 meters from the rampaging truck and heading away. There were also witnesses who reported that groups of Palestinians stood by and watched and some clapped and shouted encouragement to the truck driver. A straight line must clearly be drawn between the conduct IDF soldiers exhibited in Jerusalem Sunday and the case of the Hebron soldier, Elor Azaria, whom a week ago a military court convicted of manslaughter for killing an injured terrorist. The Azaria case has proved highly divisive in Israel, with heated arguments going back and forth over his action. But, the fact remains that, just a week later, a large group of IDF servicemen, most of them officer cadets, bolted instead of challenging the terrorist, when they were faced with the first major Palestinian terrorist attack after the court’s verdict. Prime Minister Binyamin Netanyahu who visited the scene at the end of the day called an urgent security cabinet meeting for Sunday night. Members of the terrorist’s family have been taken in for police questioning His neighborhood, Jabal Muqaber, is under lockdown. INDEED, requisite huffing and puffing and bloviating aside by Israel’s derelict leadership – par for their leftist-captured course – is on display. But make no mistake, it will not even make a dent! This is the G-d’s honest truth, as they bow to the left’s dictates and demands: do NOT use a “heavy hand” against the Arabs/Muslims and that is that! Fadi Al Qunbar, the terrorist who carried out the ramming attack at Armon Hanatziv in southern Jerusalem and murdered four soldiers, escaped serving a prison sentence in the past due to a court decision, it was revealed tonight (Monday) on Channel 10. According to the report, the terrorist was convicted a few years ago for receiving a stolen vehicle and was sentenced to 180 hours of community service. He failed to contact the probation service to begin his sentence, as the court decision had demanded, and police asked the judge to be strict with him. A court request was filed to convert his sentence to imprisonment. However, the judge rejected the police request. The terrorist refused to attend a portion of the hearings claiming to be “afraid of the security situation”. Yesterday he carried out the attack with an unregistered vehicle. KNOW this: ever since 9/11/01, Islam’s barbarians have been winning, and it is due to all of the above and so much more. But what is most significant is the confused mindset of those who hold sway in Israel and America, leftists, the whole damn lot of them! STILL yet, proofs in the pudding, so to speak, must always be front and center. Thus, if NOT for the fact that Israel’s ruling left – that which permeates the political AND military hierarchy – has made it impossible for soldiers and officers alike “to shoot to kill” each and every terrorist, there is NO doubt that this week’s terrorist would have been shot that much quicker, and some of his victims would still be alive! Cause and effect. MORE specifically, is it accidental or coincidental that just last week a valiant Israeli soldier was convicted of manslaughter for killing a terrorist, followed up by soldiers and officers “standing down” (as revealed above) on the heels of the latest truck jihadi, afraid to meet the same (jailed) fate? Yes, due to Israel’s leftist braying jackals, Elor Azariya’s Orwellian conviction led to the latest non-responsive reaction, thus, the soldiers kept their hands off the trigger! At the end of it all, it took a private security guard to finally put him down, like the rabid dog that he was! Following the decision by the court, Azariya is expected to be transferred immediately from the court to prison, even before a final sentence is handed down. Azariya will likely receive his sentence in February. He could face up to 20 years in jail…. ASK yourself: are Israel’s (leftist) lunatics running the asylum, similar to America’s cesspool? LET there be NO doubt that Islam’s barbarians are winning this war to the death. Not only that, it is inordinately clear that the leadership of the twin pillars of western civilization, America and Israel, are assisting in wielding the forceps. THINK of it this way: given two antagonists – one a moral relativist, the other a moral absolutist, then, all other things being equal, the absolutist is more likely to persevere and win in any protracted conflict. This entry was posted in Uncategorized and tagged Abdul Razak Ali Artan, decimation of Christianity, Elor Azariya's Orwellian conviction, Fadi Al Qunbar, Islamic jihad in Israel, Israel & America are falling off the cliff, leftists rule Israel's roost, Palestinian terrorists by Adina Kutnicki. Bookmark the permalink. GREAT work Adina: Is the Muslim Brotherhood using Obama to form a global caliphate, an Ummah ruled by Shariah/Islamic law or are they using him?